Ukrainian Foreign Minister Pavlo Klimkin has said the Minsk agreements on resolving the situation in the east of Ukraine are in a "coma," which only Russia can end. "'Minsk' is actually not dead, but it is in a coma. Only the Kremlin can pull it out of a coma, since [Russia] induced this very coma. It did so absolutely consciously. 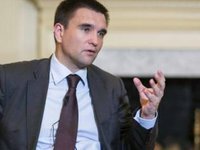 In order to bring Minsk out of this state, Russia must take the decision to leave Donbas," Klimkin told the Kyiv-based Interfax-Ukraine news agency. According to him, Moscow uses the occupied Ukrainian territories only as a means for bargaining. "Russia presently does not want to take this decision [to withdraw from Donbas]. Of course, this is connected with the elections, but even more so with the usual haggling Russia is trying to conduct with the Euro-Atlantic community," Klimkin said. The minister said the EU agenda is filled with important domestic issues, such as Brexit or elections to the European Parliament, but that Ukraine is managing to save space for countering the Russian threat. "Some of my European counterparts still say that if we cannot solve the Donbas issue now, then it is necessary to freeze it for a while. I have a simple analogy for them – you have a wound and it hurts. You can numb the wound, but at the same time it must be treated, and not just 'frozen.' Otherwise, it can't be healed," Klimkin said.